Very close to De La Warr Pavilion. 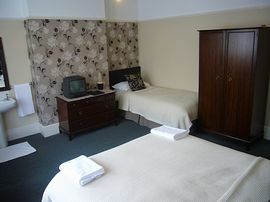 All rooms have a seating area, colour TV, clock radio, hair dryer, WiFi and full hospitality tray. 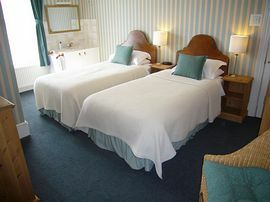 We offer en-suite and non en-suite rooms and pride ourselves on the level of comfort for our guests. 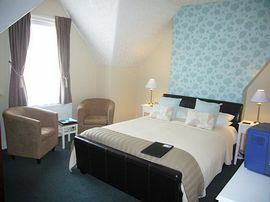 -Quality and spacious en-suite and non en-suite accommodation. -Freshly cooked English breakfast. Vegetarians catered for. 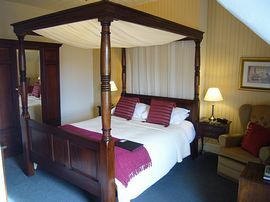 Four poster bedroom, room 5. By road from the North and East: Crossing from Essex to Kent, using the Dartford crossing. This is a toll crossing costing £1 per car. Staying on the M25 for approximately 15 miles, heading for the A21 (sign-posted Sevenoaks and Hastings). Keep on the A21 until John's Cross and turn right onto the A2100 (sign-posted Battle). After approximately 4 miles at the roundabout turn right on the A271 (sign-posted Bexhill). For a mile turn left onto the B2204, where you will join the A269 turn left, this will take you straight to Bexhill. Follow the signs (brown in colour) to the seafront and the De La Warr Pavillion. Albany road is adjacent to the car park. Using the A27 to Pevensey and then the A259 to Bexhill, again heading for the sea front. London Victoria to Bexhill changing at Eastbourne. Alternatively from Charing Cross to Bexhill change at St. Leonards Warrior Square for Bexhill. Change at Hastings then change again to Bexhill. A short walk from the station (approx. 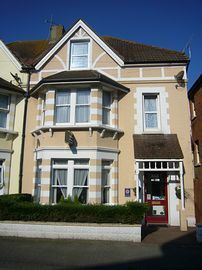 6minutes), to our Guest House down Sea Road turn right along Marina and Albany road is the fifth road on the right.